lola's secret beauty blog: PurseN Amour Travel Case Metallic Gold/Brown & PurseN VIP Travel Tote: The Perfect Travel Companions! A Happy Review! 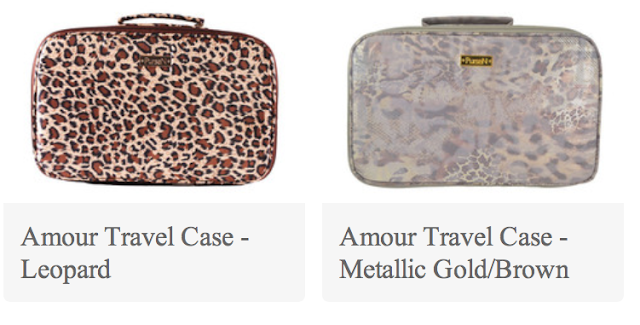 PurseN Amour Travel Case Metallic Gold/Brown & PurseN VIP Travel Tote: The Perfect Travel Companions! A Happy Review! The PurseN Amour Travel Case is an eight piece set that is designed to make traveling easy and convenient. This ingeniously designed case affords the traveler plenty of well organized space making it easy to find and use all of your beauty products. Every single detail was carefully thought out, leaving nothing to chance for even the most seasoned traveller. There is even a hidden pouch on the back that conceals a hook for hanging the case! According to PurseN, the Amour Travel Case is, "the perfect travel accessory for total organization that allows easy access to contents. 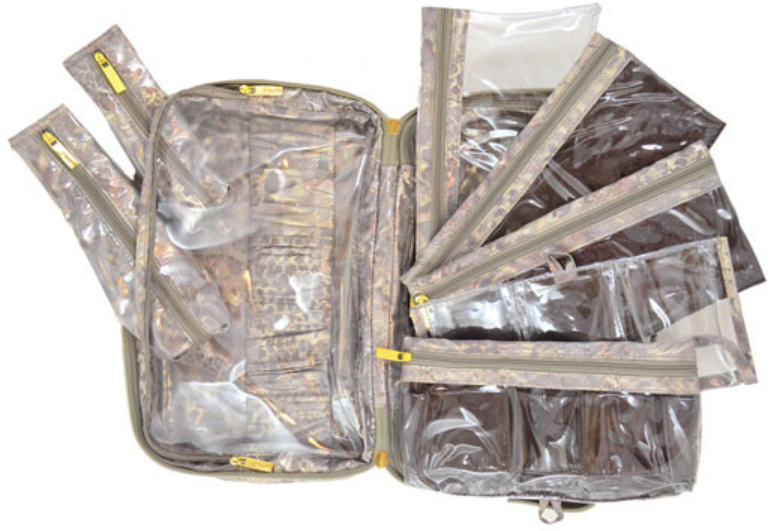 The Amour Travel Case interior was developed to have two sides enclosed by clear zipper panels. 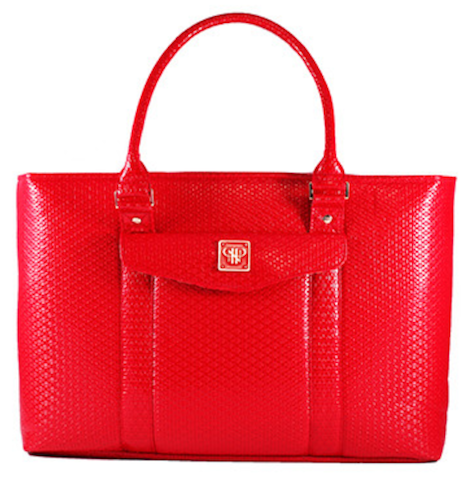 The cosmetic side has an expandable zipper panel to allow for large contents." All of which are ideal for carrying cosmetic essentials. The toiletry side (on the left) has a shirred covered elastic set in band which can hold shampoo bottles, lotions, hairspray, deodorants etc. It includes a toothbrush zipper pouch and razor zipper pouch, both covered inside and out with a clear protective cover to prevent damage from spillage. The perfect travel accessory for total organization that allows easy access to contents....The Amour Travel Case interior was developed to have two sides enclosed by clear zipper panels. The cosmetic side has an expandable zipper panel to allow for large contents. This side contains 5 removable pouches: 1. one four pocket make-up pouch 2. one clear three pleated pocket pouch 3.one long zipper brush pouch 4. one wide clear front zipper pouch 5. one large clear multi-use pouch. (All of which are ideal for carrying cosmetic essentials). The toiletry side has a shirred covered elastic set in band which can hold shampoo bottles, lotions, hairspray, deodorants etc.. It includes a toothbrush zipper pouch and razor zipper pouch, both covered inside and out with a clear protective cover to prevent damage from spillage. I put the Amour Travel Case to the test by stuffing it with lots and lots of products because I was taking a week long trip and wanted to make sure that I brought a good variation of products. It did a brilliant job accommodating all of my needs! On this particular trip I packed lots of skincare products! All five of the makeup bags were stuffed full, and they included skincare items in addition to makeup. I love that they have even included a razor holder and a toothbrush holder so that those items safely be stored with the rest of the products. You have two gorgeous patterns to choose from: Leopard and Metallic Gold/Brown! Overall assessment: This is by far the best makeup and skincare travel case that I have found to date. I travel far too much to be able to withstand the frustration of an inefficient travel case- particularly since I generally take lots of skincare products with me when I travel. Amour Travel Case $98.00 from PurseN. PurseN has another brilliant travel companion that I never take a trip without- because the VIP Travel Tote is meticulously designed to fit everything that you could possibly need for a long weekend away. -The VIP Travel Tote includes a quilted thermal lined bottle holder (shown above on the far right). I can fit so much clothing into this bag that it was the only travel bag that I took on my recent week long trip. The bag itself is very forgiving when you stuff it full-- the synthetic material stretches to accommodate a generous stash of clothing and whatever else you are carrying. For a better sense of scale I have shown the Amour Travel Case inside of the VIP Travel Case, and when I travel a little lighter it fits perfectly with the rest of what I take with me for my travels. The leopard print interior is a chic surprise each time that you unzip this fantastic bag, and it makes me smile every time that I do. Available in red or black, and both are lined with a leopard print fabric. Overall assessment: My chief grievance when I travel has always been finding suitable luggage that is convenient to use, well designed, and enables the weary traveler to be very well organized (making it easy to find what you packed). PurseN does all of this and so much more, and in fact I no longer bother with any of my other non-PurseN travel pieces. A+ must-have! VIP Travel Tote is $114.00 from PurseN. Unaffiliated links provided for your convenience. I read "Amour" as "Armour" and kept nodding my head as I read through the post. "This travel case is like the Swiss Army Knife of travel cosmetics cases", I thought to myself. I realized my error only when, in the midst of composing this post, I scrolled back to see what the case and purse were called. These look amazing. I know you travel a lot and it amazes me how much you got in there. Good finds that are so pretty too. Hi Marcia, These are simply amazing! Believe it or not- this isn't as packed as I have made the Amour Travel case-- the expansion zipper goes a long way to accommodating piles of full-sized bottles as well! PurseN has made all of my traveling so much better-- at least I am organized and can find what I need very quickly. They have the most well thought out products that I have seen on the market. Of course I will be happy when my schedule slows down a bit and I can sleep in my own bed more, but at least I am an organized traveler now!! you are right-- they are quite pretty as well! how wide are those 5 cases on the one side? it says .75 of an inch?? that doesn't seem like much?